A drone delivery is great – on a perfect, sunny day. But what about when it’s windy? 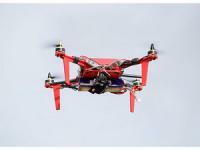 Most drones are not able to withstand wind because of their fixed-arm design. Researchers have come up with a patented design for drones that works in windy conditions, is more energy-efficient and can handle a larger payload. Traditional surveillance cameras do not always detect suspicious activities or objects in a timely manner. Researchers developed a hybrid lightweight tracking algorithm known as Kerman (Kernelized Kalman filter). In 2016, there were more than 7 million police-reported traffic crashes in which 37,461 people were killed and an estimated 3,144,000 were injured. Idling in a long highway line of slowed or stopped traffic on a busy highway can be more than an inconvenience for drivers and highway safety officers. It is one of the most vulnerable times for “secondary accidents,” which often can be worse than an original source of the slowdown. Last week, former FBI Director James Comey testified before the House Judiciary and Oversight Committees in closed session. When, at Comey’s request, a transcript was released shortly thereafter, mainstream news outlets mostly yawned, but numerous pro-Trump outlets had a different reaction, seizing on Comey’s acknowledgement that the now-notorious “Steele Dossier” was still in the process of being vetted when Comey left in the Bureau. Julian Sanchez writes in Just Security that this provided those who want to protect Trump from the Muller investigation an opportunity to revive a complaint about purported improprieties in the application for a FISA order to intercept the communications of erstwhile Trump campaign advisor Carter Page: The information provided in FISA applications must be “verified” before it is submitted to the Foreign Intelligence Surveillance Court, and here we have (the objection runs) an apparent admission that the information was not verified! But if the objection to using the material in the Steel Dossier is procedural—an argument that the FBI violated its own requirements—then the complaint is simply wrong, and based on a basic confusion about what FISA “verification” means. The fight against terrorism-related content and illegal financing online is speeding up thanks to new platforms that join up different internet-scouring technologies to create a comprehensive picture of terrorist activity. The idea is that when an online tool discovers a fragment of information it can be added to a constellation of millions of others - revealing links that might otherwise have gone undetected or taken much longer to uncover. People often say that they never forget a face, but for some people, this claim might actually be true. So-called super recognizers are said to possess exceptional face recognition abilities, often remembering the faces of those they have only briefly encountered or haven’t seen for many years. Their unique skills have even caught the attention of policing and security organizations, who have begun using super recognizers to match photographs of suspects or missing persons to blurry CCTV footage. But recent research shows that the methods used to identify super recognizers are limited, and that the people recruited for this work might not always be as super as initially thought.